I grew up eating Rice Krispies and Corn Flakes. I’d also enjoy a bowl of Cheerios every so often. My brother wouldn’t eat anything but Cheerios. I guess that made serving breakfast easy for my Mom. Cheerios is America’s favorite cereal, and it has been for a very long time. 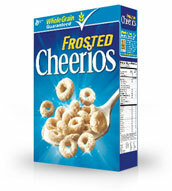 One of every eight boxes of cereal sold in the United States has “Cheerios” on the package. 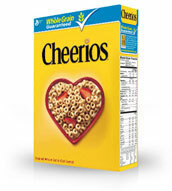 Cinnamon Nut Cheerios was General Mills’ first attempt in 1976 to extend the brand. They took it off the shelf one year later. Honey Nut Cheerios, however, introduced in 1979 was a winner. Today it is even more popular than the original. There’s also Frosted Cheerios for kids who won’t anything that isn’t sweet; MultiGrain Cereals for anyone watching their weight; and, Apple Cinnamon Cheerios and Banana Nut Cheerios for those days when there’s no fresh fruit in the fridge. Chocolate Cheerios is for those who confuse dessert with the first and most important meal of the day. All eleven varieties are made from whole-grain oats and touted as a good source of calcium and an excellent source of iron. Some contain twelve, thirteen, and even fourteen essential vitamins and minerals. 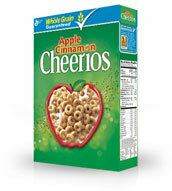 Since 1999 the company has promoted the health benefits of Cheerios. It states on the box that it was “clinically proven to help lower cholesterol,” a claim with which the Food and Drug Administration has taken issue. The case is still open. Back in the good old days before we obsessed over our LDL and HDL levels, Cheerios got our attention by sponsoring The Lone Ranger, a popular radio and then television program. In one commercial, the Ranger showed his young followers, a boy and a girl, how to used a toy gun that was distributed as a premium. “Play safe,” he instructed. Cheerios celebrated its 60th birthday with a salute to the masked man and his faithful friend Tonto by offering a retro lunch box with pictures of the dynamic duo and their horses Silver and Scout FREE when purchasing the special promotional package that included two boxes of the cereal. Pretty cool. Today the party is on the Internet. Fans sing their praises on Facebook; followers tweet their tributes on Twitter. To say “thank you,” General Mills is rewarding supporters with T-shirts and “cereal celebration kits.” The latter are to be used to host breakfast parties at which devotees tape each other enjoying their cereal. Everyone’s invited. The kickoff begins the Fourth of July. Let’s celebrate an enduring American classic, along with the red, white, and blue.